In the economic downturn, many companies are exploring options to reduce their training costs. The alternatives are limited: either severely downsize on- site training and negatively impact customer experience or find a more cost- effective way to train. One solution to reduce training costs is the Semitracks Learning Management System (LMS). What is the Semitracks LMS, and how does it save your company money? The Semitracks Learning Management System is a professional, user- friendly web software interface that enables you to manage training across your organization. You can easily add new content, track student activity, generate reports, and issue completion certificates. Secure access is controlled by ID/password login so that your materials stay protected. Semitracks LMS saves your company time and money through increased flexibility, decreased travel costs, and standardizing training material so that everyone is on the same page. First, the Semitracks LMS also allows students the flexibility to work training into their job schedules rather than having to take time off for a short course. Secondly, Semitracks LMS centralizes administration, eliminating travel expenses for instructors and students. Instead, students can log on to online training and immediately access the latest training content from wherever they are. Administrators can assemble and deliver learning content rapidly from anywhere in the world, as long as they have access to a computer with an internet connection. Thirdly, Semitracks LMS saves time by making sure everyone is on the same page. With different instructors teaching on-site training courses, participants in different parts of the country can get different sets of information. However, with a centralized online training database, each participant gets one set of information, minimizing miscommunications. 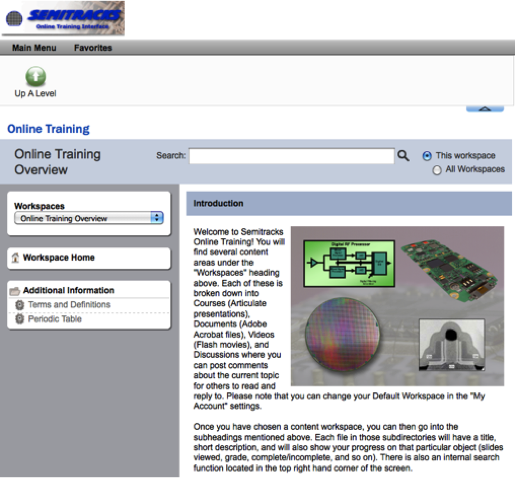 Additionally, Semitracks can customize and contribute our online semiconductor training content to fit your company’s needs, eliminating the need for your instructors to generate more content. Semitracks has over nine years of training experience in the electronics and semiconductor industries. The system must be easy enough for a first-time user to figure out. Flashy features may look appealing. However, if the system has repeated glitches or if students can’t figure out how to access learning content that is buried in a maze of links, the system can quickly become frustrating. When students spend more time figuring out how to use the LMS than learning, the system has become too complex. Semitracks LMS combines a streamlined, user-friendly interface with the features you need, making it easy to help your students focus on learning. If necessary, we can custom-build features into the learning system to better meet your needs. For me, the key to the learning process is student-teacher interaction. In a learning management system format, it’s difficult to achieve a balance of communication. A place for students to interact with expert instructors and read other students’ questions and comments is necessary to avoid confusion about training materials. As part of the LMS, Semitracks can create an online forum for student-teacher interaction. The Semitracks LMS allows student-teacher interaction to take place across the globe. Not everyone learns the same way. LMS systems geared toward one type of multimedia-- whether audio, visual, or written material-- make it harder for different types of learners to absorb the material. The Semitracks LMS offers flexibility for different kinds of content, from written text to videos to multimedia presentations. That way, the content caters to the learning preferences of different students. In conclusion, the Semitracks LMS not only reduces costs but also fits your company and your students through simplicity, improved student-teacher interaction, and flexibility for different kinds of training content. One important design consideration is avoiding wire sweep. During assembly, the mold injection process puts stress on the wires. Sufficient flow, coupled with close wire spacing, can lead to shorts. To minimize this problem, designers can implement rules at the package and die level. Consider the two chips in the figure. The chip on the left uses I pattern bonds, where the bond pads mark a letter "I" on the die. The chip on the right uses T pattern bonds, where the bond pads mark a letter "T". 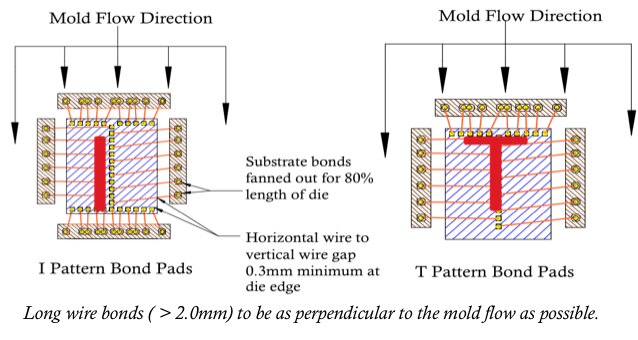 When bonding to such a device, fan out the substrate bonds, or add additional distance between each bond, to reduce the possibility of wires shorting together. Another recommendation or rule might be to establish a minimum horizontal to vertical wire gap, as shown. Finally, long wire bonds should be made as perpendicular to the mold flow as possible to reduce the possibility of wire sweep. Q: We would like to purchase Liquid Crystal and the FMI compound, but we don't know where we can buy it from. I would appreciate if someone can give me the name of a company that sells LC and FMI. A: You can purchase both materials from Accelerated Analysis. Q: I am having difficulty etching plastic packages. I have a package that does not etch open using either nitric or sulfuric acid. Are there other acids/chemicals that can be used on such packages? To eliminate the former, replace any gaskets that are worn, etched, or misshapen. You can also use, rather than a stack of gaskets, a single monolithic or pocket gasket that encompasses both the location of the part and an opening that defines the area of etch. Pocket or monolithic gaskets are the best way to define the area of etch and to hold the part. Pocket gaskets are critical with small packages. We have never run into a plastic package we couldn’t open using the proper recipe. Normally one would use a 20% fuming sulfuric acid to open a thermal plastic such as those used with T0-220 packages or some BGAs that give off lots of heat when in use. Some of old encapsulants, like those from Conexant were like cement and took long times to open but would yield to 20% fH2SO4 in time and at 230-250 degrees Celsius. Remember, good decapsulation is like good cooking – you need the proper recipe and the proper utensils. Please visit http://www.semitracks.com/courses/design/esd-design-and-technology.php to learn more about this exciting course!